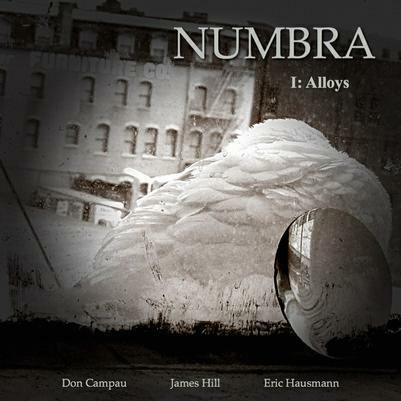 Numbra is the trio of Eric Hausmann, James Hill and Don Campau, with Hausmann and Campau creating backing tracks over which Hill plays trumpet. The 8 tracks, all named after alloys, are captivating, provocative blends of ambience, sound creation and Jazz. Ormolu opens the set with droning, cavernous soundscapes and various spaced out effects over which Hill plays jazzy melodic trumpet leads. It’s an unusual but welcome combination that brings together seemingly odd bedmates in intriguing musical ways. Cunife features drifting and windswept ambient waves plus beautifully recorded percussive clatter and bells over which the trumpet jams. Shakudo starts off as a cinematic Ambient-Jazz freakout but quickly settles into an avant-garde space-symphonic soundtrack which soon incorporates raga drones into the alien orchestral mix. I really dig this one. The avant-garde cosmic theater feel continues on Tumbaga, with its thunderous yet quietly ambient percussion blasts and assorted sounds. Elinvar goes in a different direction, bringing in a rhythm section and guitar taking the lead for a bit of ambient symphonic Prog. I love the hauntingly spectral yet dreamily melodic Space-Jazz of Shibuichi. And Indium and Bismuth are all about atmosphere and spaced out mood creation, with even the trumpet taking on an efx’d ambient sensation on Indium. I’ve always loved the 1987 David Torn album Cloud About Mercury, which featured Torn (guitar), Tony Levin (Stick, bass) and Bill Bruford (drums) creating ambient/electronic/ethnic Jazz-Fusion over which Mark Isham played trumpet. Numbra doesn’t necessarily sound like Cloud About Mercury but the spirit of Vol. 1: Alloys reminded me of that album like nothing I’ve heard since. I’ve probably listened to it a half dozen times already and the blend of electronics and sound with Jazz trumpet is spellbinding and really quite different. Check this out with headphones as the sound and channel separation is like listening in a small studio or performance space.